Revenue, profit and income, are three terms which sound same to a layman, although in business terminology there is a huge difference between them. Revenue implies the money received by the company from its day to day operations, alongwith the non-operating activities. On the other hand, profit implies the financial gain, which is arrived after deducting amount spent from the amount earned, by the concern, during the course of business in an accounting period. Income can be understood as the actual earnings of the company, left over after subtracting all expenses, interest, dividend, taxes and losses. These are three major parts or say stages of money received in the business. First in the form of revenue, then we arrive at profit and lastly, it is the income remained with the company. Take a read of this article excerpt, in which we’ve broken down all the important differences betwee revenue, profit and income. Meaning The actual amount received by the company through its business activities without any deduction is known as revenue. The surplus remained after reducing all expenses from the revenue is known as profit. The actual earnings of the company during a particular accounting year is known as income. Dependency Revenue is not dependent on Income and Profit. Profit is dependent on Revenue. Income is dependent on Revenue and Profit. 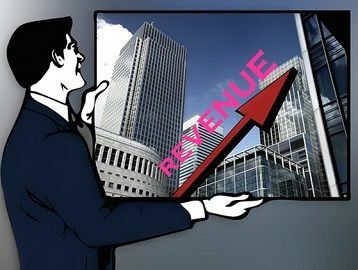 Revenue is the amount received from operating and non-operating activities of the business. Operating activities mean the regular activities of the business as the sale of goods and rendering of services. Non-Operating Activities means the activities other than operating activities of the business as the sale of assets or any amount received by way of rent, commission, and interest, etc. Revenue is also termed as Turnover. Revenue is shown in the first line of the income statement. In general, profit is the reward for the risk taken by the entrepreneur in the business. Profit is the net amount left (positive) after deducting all costs, expenses, and taxes from the revenue. Profit works as a tool in the calculation of tax of the enterprise. In simple words, the difference between the selling price of a product and its cost price is known as profit. Profit is classified as Gross Profit and Net Profit. Gross Profit is sales less cost of goods sold, whereas Net Profit means gross profit less all expenses and taxes. The net earnings of a company during a particular accounting year is known as Income. It gets calculated when the preferred stock dividend is deducted from the net profit of the business. It is the residual amount (positive) left with the company which can either be held by the company as retained earnings or distributed among the equity shareholders as the dividend. It can also be said that it is the net rise in the equity shareholder’s fund. In the context of an individual, income is the total of the salary, rent, profit, interest and gains received from any source. In the absence, of revenue, there is neither profit nor income in the business. Revenue is divided into operating and non-operating revenue, profit is classified as gross, and net profit and income can be classified as earned and unearned income. Revenue is the gross amount, i.e. without any deductions while profit and income are derived after deductions of expenses and taxes. Now, after discussing the three terms, it is quite clear that they do not contradict instead they arise one after other. The never ending business activity starts with the arrival of revenue from which profit is realized in the form of financial benefits to the company. After arriving at the profit, the preference dividend is reduced from it, which result in the net income of the company for a particular financial year. It has provided simplest way to understand.one should go through entire page to fully understand.thanks again. Thank you very much to all, for liking our content, your views are really valuable to us.